MOVEMENT Hand-wound mechanical, Panerai P.3000 calibre, executed entirely by Panerai, 16½ lignes, 5.3 mm thick, 21 jewels, Glucydur® balance, 21,600 alternations/hour. Incabloc® anti-shock device. Power reserve 3 days, two barrels. 160 componen CASE Diameter 47 mm, steel with special hard black coating. Screw-down winding crown personalised OP. BEZEL Steel with special hard black coating. BACK Screw, steel. “Paneristi Forever” engraved. DIAL Black with luminous Arabic numerals and hour markers. Seconds at 9 o’clock. CRYSTAL Sapphire, made from corundum, 1.8 mm thick. Anti-reflective coating. WATER-RESISTANCE 10 bar (~ 100 metres). 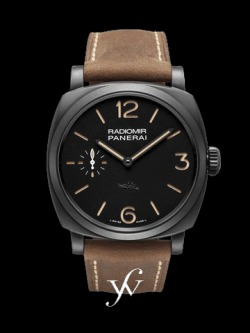 STRAP PANERAI personalised leather strap and trapezoidal matt steel buckle with special hard black coating.